Pack 002 uses online registration for pack events. Scouts must sign-up on the event Sign-Up Genius below AND pay for the event by clicking here in order to be registered for the event. Please include your Scout's name and which event the payment is for in the notes section of the payment website. You WILL NOT be considered registered for the event unless you have completed the event Sign-Up Genius and made payment. Any questions can be directed to the Contact Us page. Cub Challenge is the biggest camp-out for Cub Scouts at the beautiful Woodruff Scout Camp, located in the North Georgia Mountains. Your Scouts will be among thousands of other scouts from the Atlanta Council who are seeking to Be Brave, Stay Strong and Survive. Activities include archery, BB guns, bouldering, and many other special challenges. Scouts will be compete in over 14 challenges that include brave beam, eagle eye, monsoon, and escape the woods challenges. Events will be completed in teams of 6-8 Scouts. The cost for activities is $46 per scout or sibling participating and $11 per adult. We will dine at the dining hall for Saturday and Sunday. The menu can be found here. There will be a $22.50 cost per person for food (Saturday breakfast, lunch, and dinner; and Sunday breakfast) in addition to the activity costs. Frequently asked questions and the schedule of events can be found here. Deadline to sign up is 3/6/19. Hear ye, hear ye....the Scouts are heading to Medieval Times for a day of fun adventure, great food, and a special behind-the scenes peek at what it takes to train and care for horses in the Middle Ages. Spring Fling is a wild weekend of fishing, shooting sports, hiking, games, bouldering, and much more for Cub Scouts and their families! Come for the weekend or just for the day on Saturday. Other activities include a night hike, sports, crafts, roasting marshmallows, and visiting with special guests. Activities on Saturday will begin and end with a camp-wide flag ceremony and you won't want to miss our giant campfire in the lakefront amphitheater on Saturday night or the Spring Fling Eggstravaganza. While we will not be attending this camp-out as a pack, it is a great opportunity for family camping. Please see https://www.campbertadams.org/springfling for more information and to register. Day camp is a great way for your Scout to get a jump start on next year's rank requirements all while having a blast. This year's theme is underwater adventure. Camp is held at Kennesaw United Methodist from 9am - 3:30pm. Scouts will register as their rank for the upcoming 2019-2020 school year. 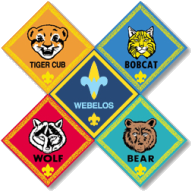 BSA requires that we have 1 adult volunteer for each 3 scouts that attend camp from our pack. Please consider volunteering or splitting the week with other adults/family members. We will be registering as a pack through our day camp coordinator so please stay tuned for more information. Pack 002 participates in the National Summertime Pack Award program through the BSA. The award is to encourage Scouts to be active during the summer months. The requirements include attending an activity in each month of summer (June, July, and August). Our June activity will be summer camp as listed above, the July activity is to be determined, and the August activity is our annual pool party at Legacy Park. Summer camp is an optional camp out held for Cub Scouts held at Bert Adams Scout Reservation. There are different camp outs based on Scout age. The camps include Summer Family Camp, Overnight Weekend Camp, and Specialty Camp. Please see https://www.campbertadams.org/cubovernight for more information or to register. Our annual pool party will be held August 2019 at the Legacy Park Main Pool. More details to follow.